It is rare that the nation’s highest court provides trading ideas. Many of its decisions are related to arcane areas of patent law or the interpretation of obscure clauses buried in the hundreds of pages of a law. But, a decision issued this week was different. The U.S. Supreme Court basically allowed states to legalize sports betting in a defeat for the major American sports leagues when the majority sided with New Jersey’s bid to allow gambling. The Court ruled part of a 1992 federal law that prohibited sports betting in most places was incantational. The court upheld the legality of a 2014 state law permitting sports betting at New Jersey casinos and horse racetracks and voided the federal Professional and Amateur Sports Protection Act (PASPA). Some states see sports betting, like lotteries, as a potentially important source of tax revenue. “New Jersey has long been the lead advocate in fighting this inherently unequal law, and today’s ruling will finally allow for authorized facilities in New Jersey to take the same bets that are legal in other states in our country,” New Jersey Governor Phil Murphy, a Democrat, said in a statement. The federal law at issue had effectively prohibited sports gambling in all states except Nevada and, to a limited extent, Delaware, Montana and Oregon. In addition to New Jersey, five other states – Connecticut, Mississippi, New York, Pennsylvania and West Virginia – already have sports betting laws in place that would allow them to move quickly, according to a Fitch Ratings report. This news will provide traders with a number of opportunities in the coming weeks. Among those opportunities is Scientific Games Corporation (Nasdaq: SGMS). Scientific Games develops technology-based products and services, and related content for the gaming, lottery, and interactive gaming industries worldwide. The company’s Gaming segment sells new and used gaming machines, electronic table systems, video lottery terminals (VLTs), conversion game kits, and spare parts; slot, casino, and table-management systems; table products, including shufflers; and perpetual licenses to proprietary table games. The company’s Lottery segment designs, prints, and sells instant lottery games, as well as offers instant game-related services comprising game design, sales and marketing support, and inventory management; and provides lottery systems, including hardware, software, and instant game validation systems. In addition, this segment provides software, hardware, and related services for lottery operations, including draw systems, instant ticket validation systems, and sports wagering and keno systems; and lottery systems software maintenance and support services. All of these segments could benefit from an expansion of gaming. Traders immediately jumped on the news. Now, SGMS is unlikely to give back the gains in the short run because traders will probably wait on additional news. This creates a trading opportunity. For SGMS, a bull put spread could be opened with the June 15 put options. 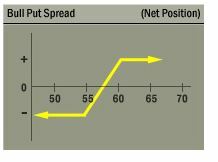 This trade can be opened by selling the June 15 $50 put option for about $0.95 and buying the June 15 $49 put for about $0.55. The maximum possible risk is the difference between the exercise prices of the two options less the premium received. For this trade, the difference between exercise prices is $1 ($50 – $49). This is multiplied by 100 since each contract covers 100 shares. Subtracting the premium from that difference means, in dollar terms, the total risk on the trade is then $60 ($100 – $40). The potential gain is about 66% of the amount of capital risked. This trade will be for about two weeks and the annualized rate of return provides a significant gain.